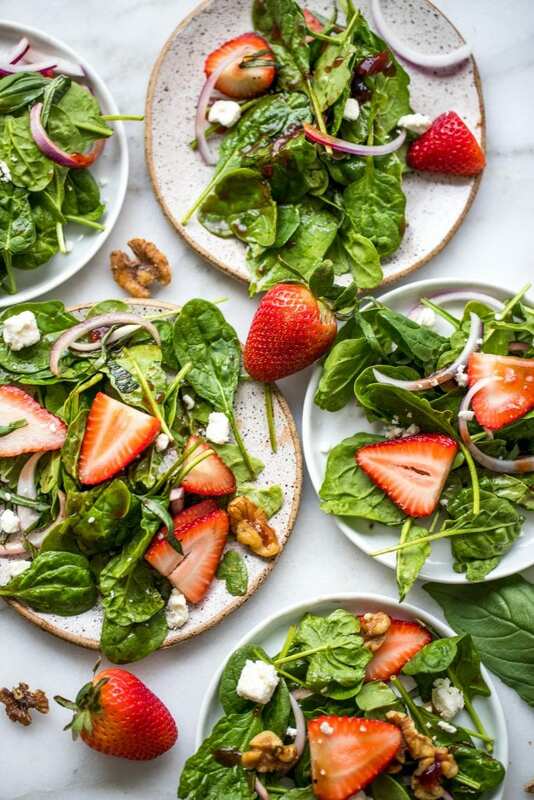 Strawberry Spinach Salad: the Spring & Summer Salad you’ve been searching for! Light, refreshing, crunchy and nutrient rich! 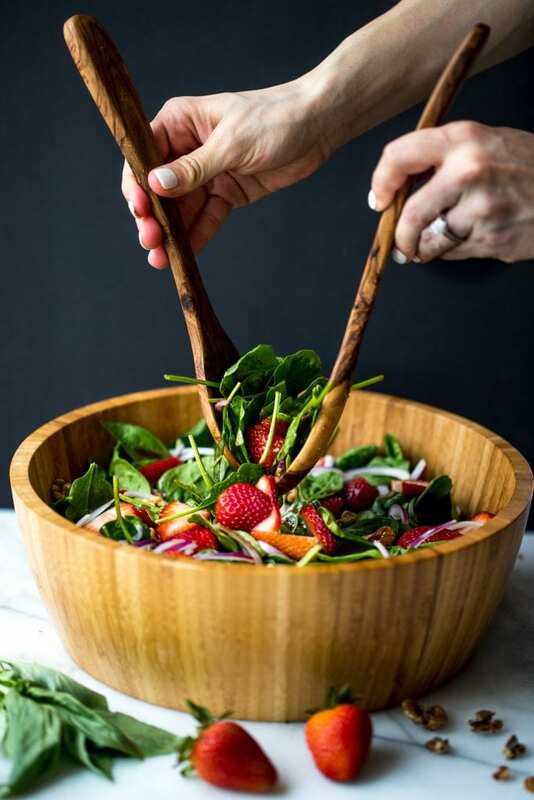 Strawberry Spinach Basil Salad screams warmer weather. It’s Spring here in Fresno about 68 degrees today but in a month or so these temps will be screaming 90 and above! A many of you know the Pilates studio I am working at is called BEYOND Studios – we teach reformer Pilates and needless to say – I’m HOOKED. I love that it is low-impact, yet we make it challenging by adding in cardio components (like using the trampoline)! We call the workout PHIT – Pilates Hybrid Interval Training – have you worked out on a reformer before? If not, you should try! Between teaching classes, I make recipes for the blog. Living the dream life!! It’s almost 1 year since I left my stable 8-5 job and I am so thankful for this new life I have made for myself. AND ultra thankful for all of your love and support!!! Would not be here if it wasn’t for you. So a million times thank you. As a dietitian I love being able to combine my passion for health and nutrition with teaching fitness. They go hand in hand! Since I do workout so often I am constantly thinking of creative ways to fuel my body – this salad paired with a Margarita Pizza the other night hit the spot! 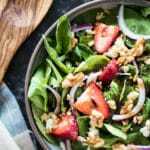 What makes this salad different from other spinach strawberry salads? I use fresh basil in my salad and the dressing is the ultimate kicker. 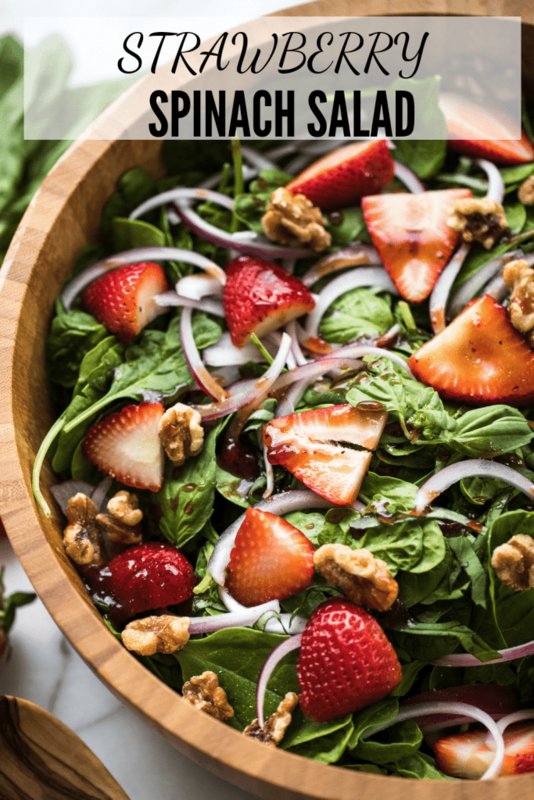 The other fixings in this salad include red onions, feta cheese, and walnuts…and strawberries of course! This dressing is hands down one of my favorite dressings of all time and it’s only 4 ingredients yet producers smashing results. You will use either boysenberry or strawberry preserves and mix with olive oil, balsamic and Sriracha. If your preserves are a little think, you can always toss in the food processor and pulse a few times. That’s it! Simple ingredients and perfect for summer! Combine vinegar, preserves, hot sauce, and olive oil in a small bowl or jar. Shake/whisk until combined and set aside. In a large bowl, mix spinach, basil, onion, and walnuts. Drizzle dressing over lightly and toss to mix. Gently stir in strawberries and season to taste with salt and pepper. Right before serving, top with the feta cheese. I can’t wait to get back to pilates (post-pregnancy)! I miss it more than I even imagined. I haven’t really gotten into reformer pilates though. Still on my list! This salad, however, will be happening immediately! It looks PERFECT!! You’ll love the reformer!! & thank you so much!! Ooh that looks crazy good! I bet the strawberries and basil are fantastic together. Thanks for such a great idea! This salad has EVERYTHING I love! I am totally and completely sold and the dressing sounds out of this world! Also, LOVE your pics! What a gorgeous salad! Perfect for healthy sprig and summer eating! That pilates workout sounds wonderful, I wonder if there is anything like that around where I live? Count me in for this summer salad! Looks so tasty!